Choosing to replace your car’s transmission isn’t a fun decision, but it is an important one — a choice that can help add years of life to your current vehicle. 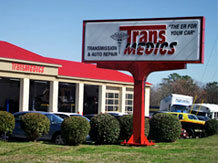 TransMedics is the number-one source for transmission replacement in Raleigh, NC — it’s the service we’ve built our reputation on all these years! How Can I Tell If My Transmission is Malfunctioning? Problems Shifting Gears – Switching gears should be a seamless process. If your manual or automatic transmission struggles to move from park to drive, it could be a sign your transmission is on the verge of a breakdown. Any hesitation, or resulting revving of the engine, indicates trouble. Fluid Leaks – Visually, there’s no better indication of a transmission issue than spotting transmission fluid. If you see a red or pink-tinted liquid pooling on your garage or in your driveway, you’ve got a leak. It could mean a fixable leak is all your car is suffering from — it could also indicate a larger problem. Check Engine Light Turns On – When the check engine light comes on, most people automatically assume the worst. While it’s important to seek help from our Raleigh, NC mechanics in the form of a free diagnostic immediately should the light turn on, it’s important to remember it’s not always a sign you need your transmission replaced. Depending on availability of parts and the car itself, most transmission replacements can be done in less than three days. To schedule an appointment for transmission replacement in our Raleigh, NC auto shop, call us at (919) 954-8699 or fill out the contact form above. We look forward to serving you!